Typically, stoplights are used during execution phase of a project. Microsoft Project is used in this example, illustrating how to set up stoplights and the underlying logic applied to drive the plan in a pro-active manner to help mitigate execution risk and provide a consistent early warning process to facilitate on-time task completion. 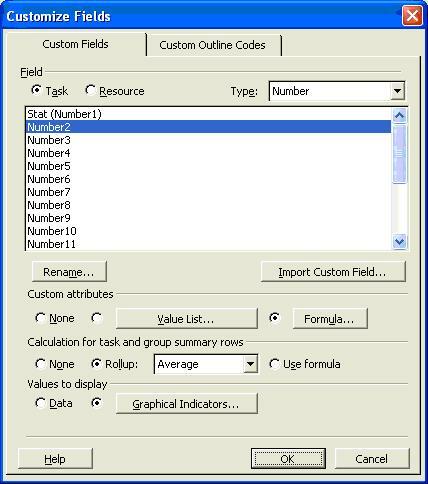 Step 1: Customize one of the available fields in MS Project (I selected the “Number 2” field for this purpose). Note: For a short duration project (typically 1 to 3 months) a value of 7 (days) is recommended for the stoplight window (see red text in formula above) – for a longer duration project a value of 14 (days) is recommended – this provides a longer evaluation window with more time to take pro-active action. The status stoplight underlying logic is discussed in the last section. Step 3: Use averages to roll up scores to group summary rows and substitute numbers with graphical indicators. Navigation: Check the radio button “Rollup” and select “Average” from the dropdown box for group summary rows. The logic for image selection is the first test which meets the logical argument will prevail (if the value in the column is between 4 and 3, red will prevail etc). This is useful for the summary group rollup values. 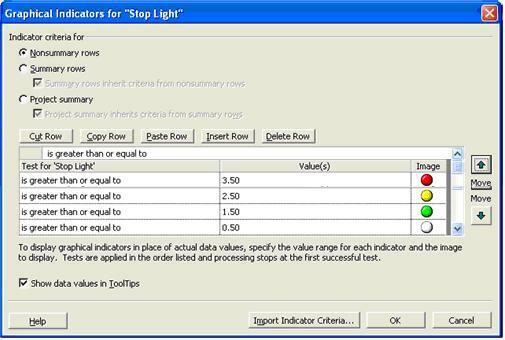 Set up four logic “tests for Stoplight” as depicted in the screen shot. 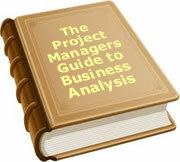 Step 4: Insert a column into the Project Gantt view and rename the column. Navigation: View>Gantt Chart. 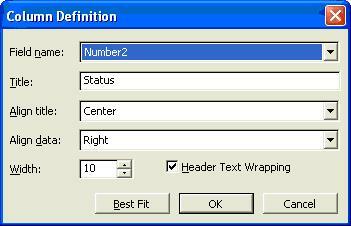 Right-Click column header at the position for column insertion. Insert Column>Select Field name from dropdown box (“Number 2”). Enter a Title for the Column (“Status”). Click OK. The column will now be in the Gantt View. See screen shot below. In simple terms a quick scan down the stoplight column will draw immediate attention to red and yellow stoplights, being the alert to take pro-active steps to re-assign resources, re-evaluate effort or update progress to facilitate on-time task completion. 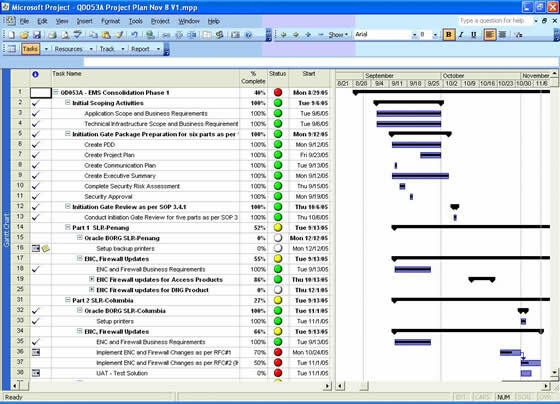 From the Gantt chart above, tasks may be filtered on the numeric value in the stoplight (status) column, keeping in mind that white (not started tasks) is less than 1, green is between 1 and 2, yellow between 2 and 3, red between 3 and 4, or simply filter tasks by date range and address tasks in priority sequence (red, yellow, green, white). 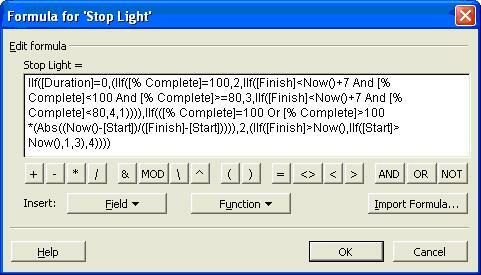 Once the stoplight column has been set up in an initial project plan, it is easily imported into others by opening the plan containing the stoplights, opening a new plan, inserting a numeric column, right-clicking the header, select “Customize Fields”, then click the “Import Custom Field” button to select the initial project and stoplight field. Rename the column by clicking the “Rename” button and entering “Stop Light” or any other suitable name after the import and your stoplight will be embedded into the new project. Logic used to drive status stoplights has two different drivers. First driver is the logic to apply to milestones to evaluate if any action is required on a zero duration milestone. Second driver is logic to drive actions on each task in the plan. If milestone is 100% then green. If milestone is due within 7 days and the progress >= 80% then Yellow (This is a signal to check if milestones are still on target for completion). 80% is a good general guideline for the next two sets of logic, this value can be changed to suit your situation and/or project duration. The lower the value, the sooner the yellow alert will pop up. If milestone is due within 7 days and the progress < 80% then Red (This is a signal to check on milestone status and potential problems which could mean moving a milestone). If task is 100% complete or if ratio of days since start divided by task duration is less than “% complete” then Green to indicate complete task. If today (date) is past the end date of the task and task is not complete, irrespective of progress reported, then Red to indicate an overdue task. If today (date) is past the start date of the task and progress is reported < (days since start/duration) then Yellow to indicate a task with insufficient progress. If today (date) is before start date of task then White to indicate a future task. Brian Thompson is a Senior Manager with Capgemini based in Massachusetts, USA. He was born in South Africa, educated at Rhodes University and Stellenbosch University where he earned an engineering degree in aeronautics. He worked in aerospace for 12 Years managing aerospace programs, projects and global projects. Re-located to North America in 1998 where he lives with his wife Tracey and two sons Brad and Matthew. Brian is a certified Project Management Professional (PMP) and an active member of the Project Management Institute (PMI). Program and project management experience in USA include managing projects and implementing Enterprise Resource Planning (ERP) solutions for a number of aerospace companies and advanced supply chain planning systems across a number of industries including financial, aerospace, automotive, consumer products, paper, gaming, leasing and government. To date, 42 people have rated this article. The average rating is 4.57 - Add your rating. Just select a rating and click the button. No other information required.